Alex Mowatt with the strike that gave Leeds United their first home win of the season. Leeds United goal hero Alex Mowatt has described his match winner against Cardiff as the best goal of his career and admitted it also ranked as his most important yet. With Leeds having gone 12 games without a win at home and 32 years since they last beat Cardiff at Elland Road, Mowatt’s superb 63rd minute strike from at least 30 yards out delivered a timely boost to the Whites. It also repaid head coach Steve Evans for his decision to bring the Doncaster-born midfielder back into the team. “That’s definitely the best goal I’ve scored,” Mowatt said. “Steve Evans told me ‘next time you get a chance, hit it’, and that was always in my head. I knew I was going to hit it and thankfully the goal went in. “I was going to shoot but I thought I was a little bit further out. But they gave me a bit more time and a couple of yards. I just thought ‘I’m going to hit it’, and then it went in. “I hadn’t been playing as well as I had been last year so my confidence hasn’t been as high as it usually would be. I’ve been out of the team for the last three games and rightly so, because I’ve not been playing as well as I should be. “But the gaffer put me in and hopefully I repaid him. “The gaffer has been good with me. He must have seen that I’ve not been playing as well as I should have been, so he put me on the bench to watch how he wants me to play. Head coach Evans was delighted with Mowatt’s contribution. He said: “I think it was a special goal worthy of winning any match. “I have seen Alex score from that kind of range with ease with such quality as an opposition manager and I told him at half-time to take one on. 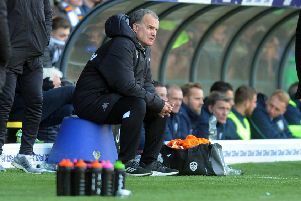 Evans admitted he was emotional after his first win in charge of Leeds. He added: “At the end of the game I was welling up. If I achieve nothing else I have won a game in charge of a famous football club at Elland Road.